This guide to artichokes has all the information you need to know about spring artichokes including a bunch of artichoke recipes to try out yourself! This is a funny one to write because we’re a house divided when it comes to fresh artichokes. I love them even with all the prep work they necessitate, Ulysses hates them. I live with a man who eats pizza with a fork and knife, sucking on artichoke leaves just isn’t his idea of a good time when it comes to a meal. We’ve agreed to disagree on this one. 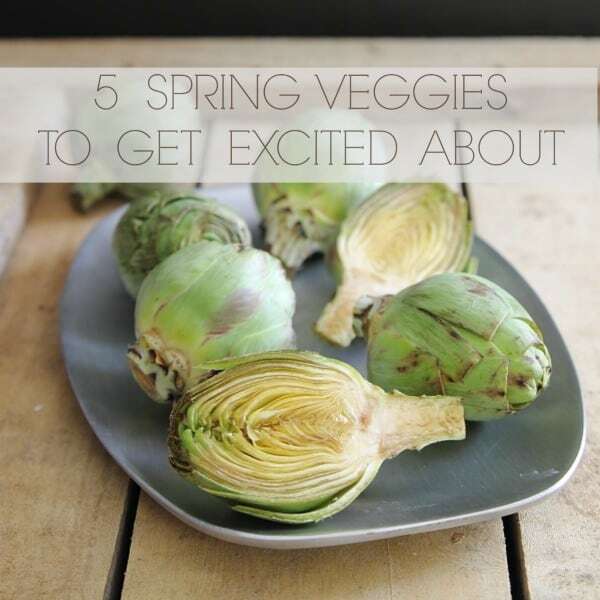 Let’s get into this week’s spring produce series – a guide to artichokes! When you think of artichokes I bet the canned, marinated ones come to mind before the fresh spring ones. They do, don’t they? You think cheesy spinach & artichoke dip not fresh green vegetable with spiky leaves and fuzzy insides. We’re gonna change that today though because these fresh ones, although a little rough around the edges (quite literally) can be so much more delicious than the watery canned ones. Peak season for fresh artichokes is March through May. And to be honest, they’re usually not worth buying outside this time. Out of season artichokes are nowhere as tender as their in-season counterpart and tend to be very rough and an all around unpleasant experience. Just skip them. Artichokes are the edible flower bud from a plant related to the sunflower. Baby artichokes are not a different variety, just a smaller bud. The most common variety is the classic green globe artichoke although purple artichokes can be found in some stores as well. Deep green color and tight leaves are what you’re looking for. Loose and darkened leaves indicate an old artichoke. The bulb should feel heavy for it’s size. Storage is easy with these guys, keep artichokes in the plastic bag from the store in the refrigerator for up to a week. Artichokes take a bit of work before they’re ready to be cooked. Stems should be trimmed and shaved, outer leaves removed and tops of the remaining leaves snipped to cut off the pointy ends. The heart, which is the inner core of the artichoke, is surrounded by fuzz. That should also be removed or avoided when eating. Braising or steaming are probably the most traditional ways to cook artichokes but grilling and roasting are also options. Artichokes are fully cooked when you can remove the bottom leaves with ease. Artichokes are packed with antioxidants! 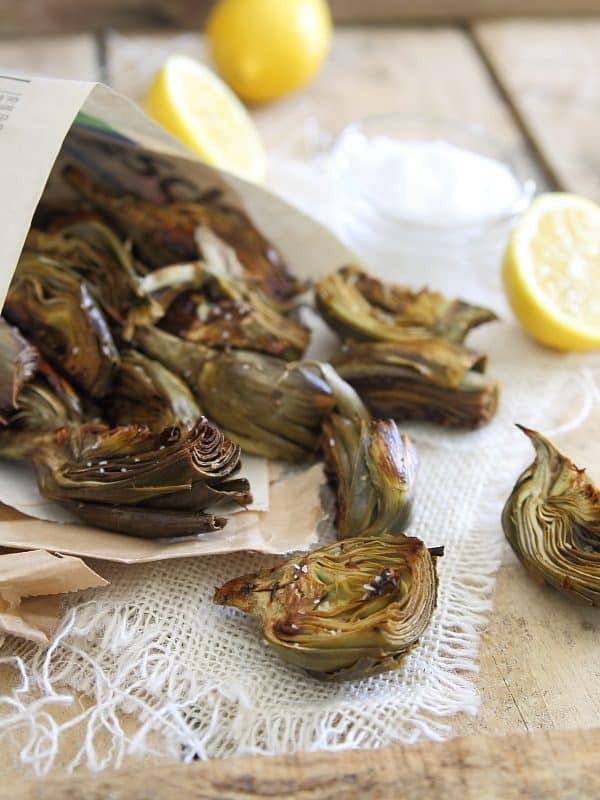 Crispy Lemon Roasted Baby Artichokes – These roasted baby artichokes tossed in lemon juice, baked until crispy and sprinkled with kosher salt making a delicious spring snack or side dish. 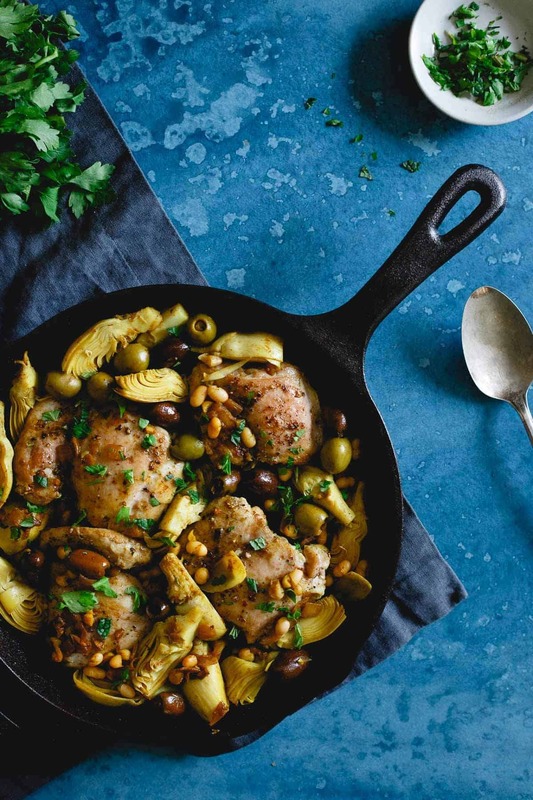 Chicken Artichoke Olive Skillet – While this easy skillet dinner uses canned artichokes, you could easily replace them with baby artichokes when in season! Can’t say I’ve ever made artichokes. There have been some attempts.. I’ve purchased artichokes in past with hopes of prepping but they went bad before I got to them. Thx for this post. I’ll pin it for future reference! Artichokes are one of my favorite spring vegetables. I love having them steamed with a little butter to dip the leaves in on the side. Love artichokes, but never make them fresh. This is the spring that I’ll do it though! I LOVE artichokes cooked with a bit of rosemary and garlic and topped off with a dash of sea salt and olive oil! Yummy! Looking forward to trying some of those yummy recipes! Thx ! Thanks for sharing – I love the recipes you’ve shared!! I love artichokes, but I’ve never cooked with them because I didn’t know how/they seem like they take forever to prep!